If a genetic variant is the origin and a disease the destination, the biochemical path between them may appear on a map of a sprawling genetic/metabolomic network. But that’s just the simplest imaginable use of such a map. Rather than think of a genetic/metabolomic map as a way to trace a single path, as though one were using a transit map to trace an individual’s commute, one might think globally, in terms analogous to those used by traffic managers. For example, what snarls might arise if multiple stations and transfer nodes were to become overloaded? This approach to analyzing the genetic influences on metabolism, and metabolic diseases, is becoming a reality thanks to projects such as the one recently completed by researchers based at the Wellcome Trust Sanger Institute. These researchers, led by Nicole Soranzo, Ph.D., have compiled an atlas of genetic associations with metabolism that has linked 145 genetic regions with more than 400 metabolites in human blood. 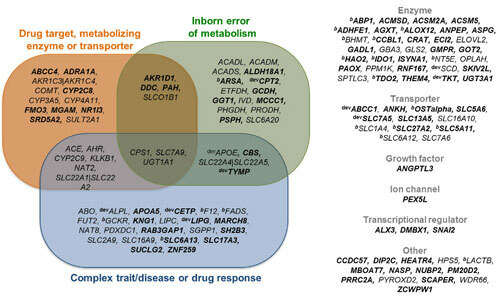 This new compendium of associations between genetic regions and metabolite levels provides a powerful tool to identify genes that could be used in drug and diagnostic tests for a wide range of metabolic disorders. Other associations suggest tantalizing possibilities for further study. For instance, a number of the genetic associations identified involved aromatic acids, such as tryptophan, which are important for brain function. While this study did not measure association of metabolites in the brain, these genetic findings open new avenues to assess potential genetic influences on brain function and responses to drugs that affect brain function, such as antidepressants.